Andy Smith, or ‘Smudger’ as his friends call him, is a keen cyclist. 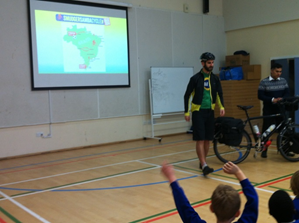 He cycled 5000 miles over the summer through Brazil. He started in January, so when he finished he could watch the world cup. While he was cycling he could see the stadiums being built. His cycle was called ‘SmudgerSambaCycle’. He did an exclusive interview with the Rockmount Bike it crew. By Eve, Jacqui and Zac.